Fully assembled and tested. (all the parts you need). However, the Eden board itself comes fully assembled. 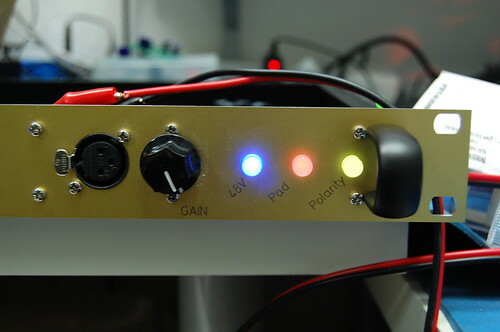 You only need to add a front end (switches for phantom, phase etc) and a gain control resistor. Is there a case available for it? I hate making my own cases!" 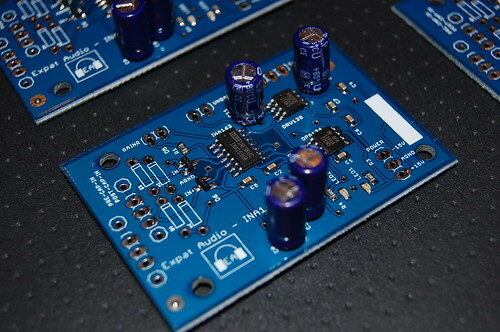 I designed and built a handful of these INA163 reference design boards last year (INA163 front end, OPA134 DC servo, and DRV134 balanced driver). I really like it! It's super clean and detailed, tons of gain, and you can literally stuff dozens of them into a 2U rack. that's awesome! I think i saw your thread last year. I've been dabbling with the intention to make this circuit for a few years. When I picked up a used pick and place assembly machine earlier this year, I saw this as one of the first projects I could do that'd be a great pipe cleaner for the assembly setup! It's awesome where it all comes together, and the performance through the circuit really is stunning. Very clean with acres of gain! I'll have more pics up later this evening. -- Top down of the same board. For reference the board is less than 2.5" x 2"
I started putting together a dual mic pre box. (just floor planning right now,I need to order some more parts from Mouser to finish it). Wanted to share nonetheless. I love the LED switches on the 3 button controller, but i'm regretting putting XLR Inputs on the front panel. They busy things up WAY too much! 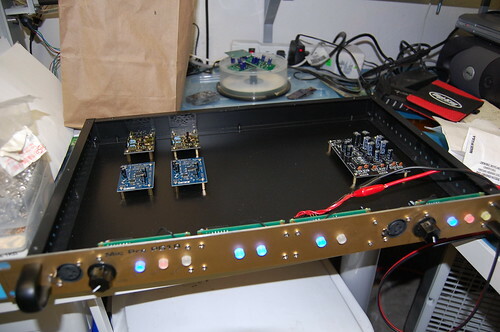 The digital rail for the LED's and the relays on the input board can be run separately from the analog mic pre supplies. I'm planning on using a el-cheapo wall wart. Maybe even a USb cell charger. The Power domains never mix, so I'm not too worried about noisy crosstalk issues. Such a big case for 4 little boards! yeah, next time I'll put all connectors on the back, and run 4x Mic Pre's in the case. I could probably get away with a 8" depth on the case. maybe even less. When I purchased this case from par metal 3 years ago, I wasn't too sure what was going to end up in it. How about we say that this Mic Pre has amazing "Air" ? Looking good Rochey! Keep us up to date on this. Really slick work, Daf !! 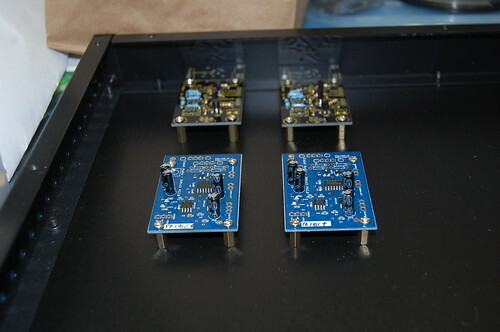 Are the mic pre and controller PCBs same size, can you stack them to get smaller footprint? If they aren't...they will be next round, great idea! I've got four of these on the bench here... a pre-production variant, but the same exact circuit. My measurements here confirm Rochey's numbers, and in addition I've done some noise rejection 'torture testing'. -Despite some deliberately noisy cable runs, they are exemplary in producing clean signal, even at high gains! I'm putting these four in a case right now, and the weekend after next I have a gig with the Messiah Choral Society, where the cable runs from the suspended mic positions above the stage are in excess of 500 feet, past power runs etc . -This will be an excellent opportunity to see how well they do under exaggeratedly 'vulnerable' conditions. So far I'm extremely impressed with these little buggers... -More observations to come, as real world testing continues. My initial impression so far is that these really are most excellent preamps for when you need some more inputs. (and who among us couldn't use a few more inputs!?!) -For the price they're incredible, and they fit comfortably into tiny spaces. -A single-gang pot (readily available) or -alternatively- a multi-position switch and resistors (for stepped-gain applications) is all you need other than an input connector, an output connector and power. Simple, VERY affordable, but incredibly impressive figures. Listening impressions are "super-clear". How about a video of the pick'n'place in action? How do think they will behave with low impedance ribbon mics? The data sheet talks about an ideal source impedances of 200ohms, but my fav ribbons are 50 ohms. Are there pads on the pcb to implement the 'input stabilisation network' mentioned in the data sheet, might be necessary with low imp. ribbons? Noise figures bloody impressive! A couple of these could be the answer for recording quite sources with ribbons. Thats a really great question! I hadnt considered the load that ribbons can impose on a mic pre when i initially laid out the circuit. On the available boards the are "pre-cap-in" connectors ans "post-cap-in" connectors. The idea being that customers can put their dc blocking cap on-pcb or off", depending on size etc. 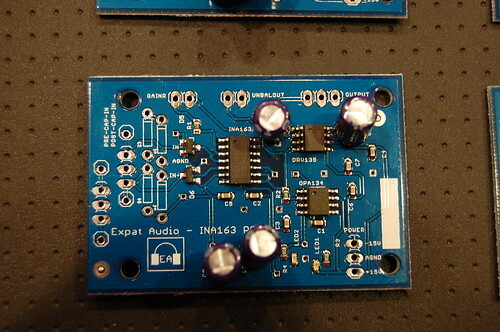 That means that there is room for a series circuit between the input connector (pre-cap) and the ina163. With a little elbowgrease, you could put theinductor and resistor required in parallel into those pins. As for a video of the production setup, I'll definately do one soon. I dont really have good video editing skills or hardware, so it might be a quick'n'dirty job. Hopefully that's okay! 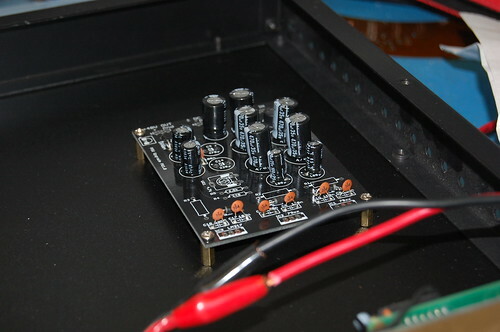 Yes, for "ribbon-specific" applications, -since people like Millennia Media make preamps WITHOUT the DC-blocker capacitors, I assumed that people might want to replace the DC-blocking caps with the stabilization network, since they would connect on the same pins. Getting a bit behind with the mechanical build for next weekend... back to work, heads-down! These are inexpensive enough that I built a pair without caps specifically for use with dynamic's, and two with for condenser applications.